Septic issues are no fun to deal with. However, it's critical to combat the problem as soon as you notice something is wrong. Letting a septic tank issue go can only get worse. Some common septic tank issues are gurgling through pipes in the home, septic tank smell and green grass only near the septic tank. If you have a strange gurgling noise going on in your pipes throughout your home, it's usually a cause for concern. Pipes aren't supposed to make gurgling sounds unless there is an issue. Worse yet, if you find your sink and tubs backing up along with the noise, you can be sure you have a septic tank issue. Thankfully, though, it usually means your septic tank needs to be pumped out. When your septic is overfull, it won't allow an adequate flow of materials and water from the tank to your drain field. 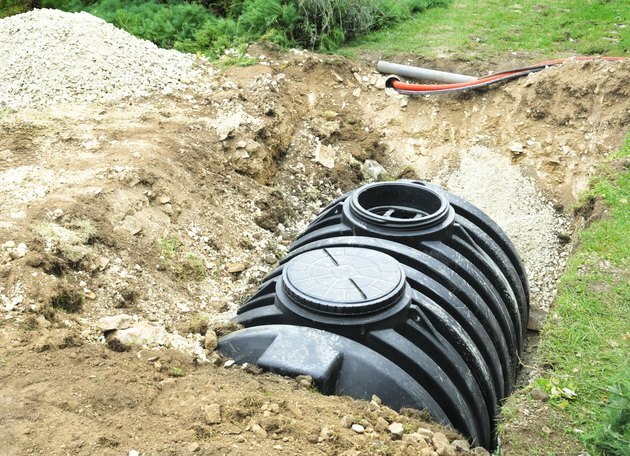 According to the U.S. Environmental Protection Agency, a septic tank should be pumped every three to five years. However, keep in mind it could be more or less depending on your household size and usage. Gurgling in pipes doesn't always signal an overfilled tank, so be aware there could also be other issues. Some common culprits are a blocked plumbing drain, blocked sewer piping or blocked or inadequate drain-vent system. You should never notice a septic smell that fills your home. If you do, there are a few problems it could be. Dried Out P-Trap: A home is connected to a septic tank through a number of pipes. There is water trapped in the pipes that will prevent odor from the septic tank from accessing your home. Sometimes the water can dry up and you may smell a septic odor, which is usually in the bathroom. However, the solution would be just to add water to the pipes. Start by shining a flashlight in the sink and floor drains. Check for water inside the drains. If the drains seem dry, add two quarts of water. Run any toilets, sinks or showers that you don't use consistently. Clogged Vent Pipe: A plumbing vent is a pipe that connects to your plumbing. This pipe exits through the roof of your house. The vent pipe equalizes pressure in the pipes, preventing many issues that could occur, including smells and gurgling in toilets. Keep in mind that this vent can become clogged with falling debris, dead birds, tennis balls or anything that could have been thrown on the roof. To unclog this pipe, use a drain snake found at your local home improvement store or pour water down the pipe to see if the clog will dislodge. Everyone wants green grass but not when it comes to the grass only being green near your septic tank. If the rest of your yard is dried up or looks brown while the grass near your septic tank looks bright green, you may actually have a septic issue. Your septic tank could have a leak or your lateral lines are getting too much wastewater from the septic tank, which in turn is saturating your yard. If you look close enough, you may even see raw sewage or puddles on your lawn, leading to a dangerous environmental and health hazard.